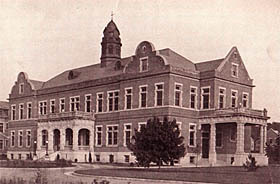 (1897) The Polk Center (Polk, PA) is the first state-operated institution for persons with intellectual disabilities in PA.
(1903 - 1908) The first buildings of the Eastern State Institution for the Feeble-Minded and Epileptic are completed on a site known locally as 'Crab Hill.' The facility is situated in Chester County, near the Borough of Spring City. The first group of buildings includes 'P' [subsequently renamed Philadelphia Building], 'Q' [Quaker Hall], 'R' [Rockwell Hall], 'F' [Franklin Hall], 'G', 'N' [Nobel Hall], 'U' [Union Hall], 'V' [Vincennes Hall], 'T' [Tinicum Hall]. The 'K' and 'I' [Industry Hall] Buildings were completed within two years of the facility's opening. Numerous farm buildings were also completed in the first wave of construction, as well as a sewage plant and a power plant. 'P' Building is used as an interim Administration Building until the actual 'A' Building is completed. (1912) From the outset, Pennhurst was overcrowded. Designed for epileptics and persons with intellectual and developmental disabilities, there was tremendous pressure to admit many different persons whom society, steeped in the eugenics movement, wanted removed from the gene pool, including immigrants, orphans, criminals, etc. But even the stated mission of Pennhurst - to house epileptics and 'the feeble-minded' - came under fire from within the institution as early as 1912. In that year, the Superintendent reported to the Board of Trustees in chilling language that 'It is without question absolutely wrong to place the feeble-minded and epileptic in the same institution. They are not the same; they are as different, one from the other, as day is from night. They are mentally, physically and morally incompatible, and require entirely different treatment.' The admission of individuals with epilepsy and normal intelligence continued for several years. The mission of the institution was eventually clarified and only people with intellectual disabilities were admitted from then on. While the terms 'mental hospital' and 'insane asylum' are often used in association with Pennhurst, it was neither. (1913) The PA Legislature, partially in response to concerns raised by the Pennhurst Board of Trustees, appoints a Commission for the Care of the Feeble-Minded. The Commission's conclusions included a statement that the feeble-minded were "unfit for citizenship' and that they posed a "menace to the peace." They recommended a program of custodial care to "break the endless reproductive chain." The language used by the Commission to describe disabled residents as "unfit for citizenship" is hauntingly familiar to similar language used by disgraced Supreme Court Chief Justice Roger Taney in Dred Scott v. Sanford, 60 U.S. (19 How.) 393 (1857) sixty years and 600,000 Civil War dead earlier. 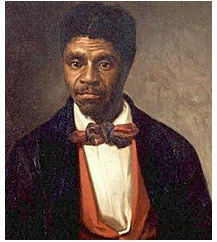 The Dred Scott decision held that African Americans were "beings of an inferior order... altogether unfit to associate with the white race, either in social or political relations, and so far inferior that they had no rights which the white man was bound to respect" and therefore unfit for citizenship. These same philosophies were used to justify the forced institutionalization of persons with disabilities as a means to keep them from "associat[ing]" in "social or political relations." (1916) In what would be a recurring theme in subsequent reports, the Board of Trustees concludes their biennial report as follows: "Before closing this report, our Board suggests the consideration of plans for further increasing the capacity of the Institution by the erection of a group of cottages exclusively for female inmates, at sufficient distance from the present group to segregate them. Such group of buildings to accommodate, say, 1200 girls would be advantageously located upon a site now owned by the State, and could be supplied with water, heat, light and power from the present reservoir and power plant of the Institution with comparatively small additional expense." The administration of an Institution containing 2400 inmates instead of 1200 could be conducted with but a slight increase of overhead expense. "The need of additional space for both girls and boys is being manifested every day by the numerous applications to courts for commitments to our Institution, and we feel it would be in the line of economy for the Legislature to supply the capacity in this Institution to meet this ever-increasing demand for the support, care and improvement of these unfortunate boys and girls." (1918) Pennhurst was built as a world apart from the rest of society both to keep the 'feeble minded' from the public but also to end the intermixing of their genes with the population. 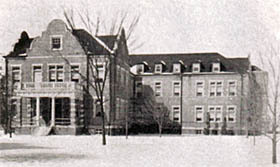 A concern about the reproduction of the 'feeble minded' also was reflected in the desire to keep the sexes separated even on the Pennhurst campus by means of building a separate female campus. These ideas were part and parcel of the then-popular ideas of eugenics. 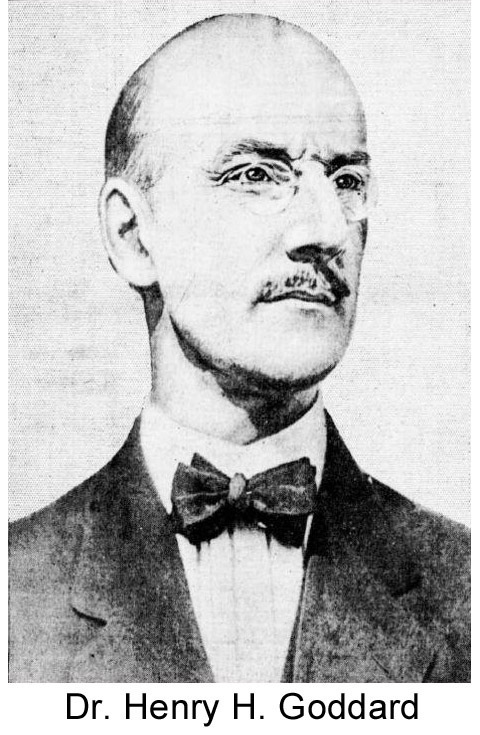 In the Biennial Report to the Legislature submitted by the Board of Trustees, Pennhurst's Chief Physician quotes Dr. Henry H. Goddard, a leading eugenicist, as follows: "Every feeble-minded person is a potential criminal." The quote is used to support the argument for an expansion of the institution. The report goes on to say, "The general public, although more convinced today than ever before that it is a good thing to segregate the idiot or the distinct imbecile, they have not as yet been convinced as to the proper treatment of the defective delinquent, which is the brighter and more dangerous individual. It is now generally understood that feeble-mindedness is in the great majority of instances the direct result of hereditary transmission of mental defect. It is also known that the feeble-minded female is very likely to bear children and that these children are almost certain to be defective or in some way permanently dependent. The feeble-minded girl is more of a menace to society than the feeble-minded boy. Statistics show that feeble-minded girls and boys marry in the ratio of three to one. It would seem, therefore, that if the State is not adequately equipped to care for all of the feeble-minded, the feeble-minded girl should have institutional care in preference to the boy, since she is the greater menace." The eugenics movement was short-lived in the United States. Discredited in no small part by the horrific eugenically-driven experiments and programs of the Nazi regime, the movement was shown to be scientifically baseless and racially biased. (1919) "L" [Limerick Hall] and "M" [Mayflower Hall] Buildings are completed. (1921) The Pennhurst Hospital is opened. 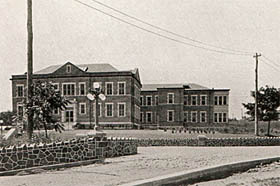 Completion of the hospital essentially concluded the development of the original campus. Penn Hall (designed to provide employee housing) and the Auditorium would be opened in 1929. No other residential buildings would be constructed on the main campus until "D" Building [Devon Hall] was built after World War II. (May 31, 1930): In the biennial report of the Board of Trustees it is noted that there are 1,247 individuals in residence. There are 192 employees. The report also states: "The two ward buildings for girls and an employees' cottage, which have been under construction during the greater portion of the present year, are nearly completed. Completion of these buildings (Female Buildings #1 and #2), which will be entirely modern and which will constitute a new group exclusively for female patients, a short distance from the existing group, will be a most valuable addition to our Institution. These buildings, with a capacity of at least 300 additional patients, will temporarily relieve our overcrowded condition, as soon as patients are admitted to the buildings. However, the present conditions of overcrowding will continue with many more applications for admission than we are able to accept. The need of additional buildings for both boys and girls is manifest at all times, by reason of the many applications for admission to our Institution. We, therefore, feel that it is in the line of economy for the legislature to supply additional capacity in this School, to meet this increasing demand for the support, care and training of these unfortunate children." It was reported that there were 900 applications for admission on file, with new applications coming in at a rate of 250 per year. 240 individuals were admitted during the two-year period covered by the report. The Arc is the largest advocacy organization in the United States for citizens with intellectual and developmental disabilities, and their families. The Arc of Pennsylvania is the state chapter of The Arc. The Arc's mission is to work to include all children and adults with intellectual and developmental disabilities in every community. We promote active citizenship and inclusion in every community. In conjunction with its local chapters and the national organization, The Arc of Pennsylvania works every day to carry out its mission - to work to include all children and adults with intellectual and developmental disabilities in every community. Local chapters of The Arc focus on providing resources and individual advocacy services. The Arc of Pennsylvania focuses on systems advocacy and governmental affairs, demonstrating leadership and guidance among all disability organizations in Pennsylvania. The in-house population of Pennhurst peaks at 3,500 individuals. Two 'annexes' of the facility are opened in former tuberculosis sanitariums, one located west of Gettysburg and the other in White Haven, near Scranton. Hundreds of residents are transferred to these 'new' facilites (which remain an administrative part of Pennhurst under the direction of the Superintendent). The availability of this additional capacity allows the population of Pennhurst to grow to 4,100 individuals, while the number of people actually living at Pennhurst drops to 3,200 by 1961. The two annexes are 'spun off' from Pennhurst in 1961, becoming the Hamburg and White Haven State Schools. (1966) A new Mental Health & Mental Retardation Act is passed by the PA Legislature. For the first time, it authorizes the provision of some services in community settings and establishes a network of county-managed "base service units" that would serve as "gateways" to the service system. (1968) Conditions at Pennhurst are exposed in a five-part television news report anchored by local CBS correspondent Bill Baldini. While this is the first time that conditions in the facility have been shown to the general public, it is not the first "expose" of Pennhurst's failings. Numerous newspaper articles, legislative inquiries and other investigations have been focused on Pennhurst over the decades, beginning shortly after its opening. The fact that new "exposes" arise on a regular basis is evidence that little was done to alter the basic nature of the facility or to solve the problems innate in the custodial warehouse model of "care." Baldini is now on the PM&PA Advisory Council. (January 7, 1971) PARC v. Commonwealth of PA is filed in Federal District Court. The lawsuit seeks access to public education for all children. The "right to education" lawsuit is eventually settled via a consent decree which becomes a model for a national right to education law passed in 1974. In their lawsuit, the ARC challenged the constitutionality of a state law allowing de jure exclusion of children with intellectual disabilities from school. The statute assigned the responsibility for children with intellectual disabilities to the Department of Public Welfare. As a result of exclusion from school, large numbers of children with disabilities were institutionalized while they were still of school age. The case was resolved in 1972 in a consent decree establishing the right of all children with intellectual disabilities to attend public schools. (May 18, 1971) Constitutional Protection for Historic Property - PA amends its Constitution, adding the "Natural Resources Clause," which references the Commonwealth's duty as trustee of natural resources, and the people's right to the preservation of the natural, scenic, aesthetic and historic values of the environment. The Clause is interpreted to mean the Commonwealth holds its historic resources in a public trust for the benefit of current and future generations. 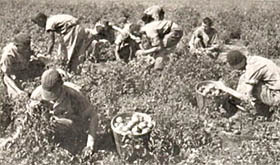 (December 7, 1973) In the case of Souder v. Brennan, The Supreme Court upholds a lower court determination that the minimum wage and overtime compensation provisions of the Fair Labor Standards Act apply to persons residing in state-operated facilities for persons with mental retardation and mental illness who provide work that would otherwise be done by paid employees. The ruling puts an end to peonage, the practice of using the unpaid labor of residents to operate facilities such as Pennhurst and makes the continued operation of such facilities increasingly more expensive. A consent decree ending peonage had been reached in a similar case (Downs v. PA DPW) prior to the Supreme Court ruling. (May 30,1974) Landmark civil rights case Halderman v. Pennhurst State School is filed in the U.S. District Court for the Eastern District of PA by a the mother of a Pennhurst resident. The case would eventually reach the United States Supreme Court. The case is assigned to District Judge Raymond Broderick. (November 1974) The United States of America moves to intervene as a plaintiff in the Halderman case. The USA's motion to intervene is granted in January 1975. Six months later, The PA ARC, represented by the Public Interest Law Center of Philadelphia (PILCOP), moves to intervene in the Halderman v. Pennhurst case. The PARC motion adds the five counties in SE PA as defendants in the case. PARC's motion seeks community placement for all Pennhurst residents. 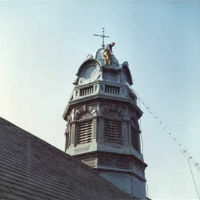 PARC's motion to intervene is granted by the Court in November 1975. (1975) The United Nations adopts a Declaration on the Rights of Disabled Persons. (May 6, 1975) Pennsylvania's Governor issues Executive Order 1975-6, calling for state agencies to maintain its historic property like Pennhurst and to consult with the Pennsylvania Historical and Museum Commission prior to the transfer of such property into private hands. (October 4, 1975) The Federal Developmental Disabilities Assistance and Bill of Rights Act (P.L. 94-103) is signed into law. It establishes a system for protection and advocacy organizations in each state and enumerates certain rights for persons with developmental disabilities. (April 1 1977 - June 1 1977) Halderman v. Pennhurst is tried. The Honorable Raymond J. Broderick rules in favor of the residents, declaring that forced institutionalization of persons with disabilities is unconstitutional. The District Court determined that Pennhurst provided "such a dangerous, miserable environment for its residents that many of them actually suffered physical deterioration and intellectual regression during their stay at the institution." (1979 - 1985) The Pennhurst Longitudinal Study finds that Pennhurst residents who moved to the community are "better off in every way we know how to measure." Before the relocation of residents, 60% of families of Pennhurst residents opposed the residents leaving Pennhurst; six months after relocation, more than 80% of the same families came to agree that relocation had been the right decision (quotes are from Judge Broderick's opinion of 2/6/98). (1984) Final Settlement Agreement between the Halderman v. Pennhurst parties provides for the closure of Pennhurst. The agreement was approved by the District Court in April, 1985. (1984) Pennsylvania Historical and Museum Commission deems Pennhurst eligible for the National Register of Historic Places. Such action made the Pennsylvania History Code apply to the property, which meant the state had an obligation to not let the buildings fall to waste and to not sell the property without consulting with the PHMC to see if a covenant for its preservation and re-use should be included as a condition of the sale. By 2008, it became clear the state violated both of these laws. (1986-1987) Pennhurst closes. In the ensuing years the Commonwealth has closed numerous other facilities for persons with intellectual and developmental disabilities. In 2010, five state centers remain, serving fewer than 1,300 people. 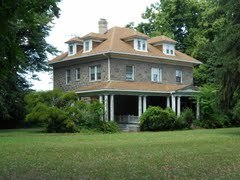 (1986) A portion of the Pennhurst property is re-purposed as a residential home for PA veterans. The SE PA Veteran's Home opens in 1986. Another portion of the upper campus is turned over to the PA National guard for use as an armory. 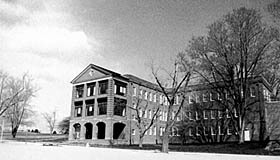 (1989-1998) Enforcement and contempt proceedings on behalf of class members in Delaware, Montgomery and Philadelphia counties results in community placement of several hundred persons who were transferred from Pennhurst to other institutions before the Court's decision of 1977, and significant improvements in the community service system in Philadelphia. Grassroots effort to oppose sale. State Senator Gerlach recruited to lead opposition. (October 1991) East Vincent's Board of Supervisors agrees, at the request of the Township Parks Board, to write to DGS to express the Township's interest in acquiring park land at Pennhurst. (July 1993) Pennhurst Land Use Feasibility Study determines how Pennhurst should be developed. Strongest support was for park use of ball fields area and riverfront. Other concern was to control the type of development on the non-park land. (1995) Pennhurst Regional Development Authority (PRA) formed. Includes representatives from area municipalities. In December 1996, PRA produces Master Site Plan, paid for in part by Chester County tax dollars, calls for the Township to receive a 46.4-acre park encompassing the existing baseball fields and riverfront at Pennhurst. (1995) Pennhurst is listed on the Heritage Corridor Management Action Plan Resources Map as a recreation/open space resource for the new Schuylkill River Heritage Corridor (a PA state designation). (1997) Red Knights Athletic League works with East Vincent Rec Board to seek Pennhurst lands north of Commonwealth Drive directly from Commonwealth. (1997-1998) DGS bids out Pennhurst. Of that land, under PRA's Master Site Plan, approximately 62 acres was to be Senior Living and 38-acres was to be our Township Park. DGS agrees to sell Pennhurst to private developer. (2003) Alliance Environmental Group, backed by First National Bank of Chester County, offers to clean up Pennhurst and turn over Pennhurst to the Township at no cost to the Township if the Supervisors express interest to the Commonwealth. (October 2003) Pennhurst Associates sues DGS after DGS terminates agreement of sale, claiming $800,000 spent in efforts to seek approvals/develop Pennhurst. (May 31, 2005) The state adopts the Keystone Principles, a "coordinated interagency approach to fostering sustainable economic development and conservation of resources through the state's investments in Pennsylvania's diverse communities." The Keystone Principles re-affirm the state's duties to maintain historic property like Pennhurst and to consult with the Pennsylvania Historical and Museum Commission prior to the transfer of such property into private hands. (2003-2006) US Congressman Jim Gerlach, at request of different veterans advocacy groups, seeks to establish a federal veterans cemetery at Pennhurst. Gerlach indicated that if federal veterans cemetery could not go forward, perhaps a combination of state cemetery and park would be a possibility. In January 2006, the VA rejected the proposal. (November 2007) East Vincent Supervisors Zaremba (following election loss) and Costello voted 2-1 to approve a subdivision of Pennhurst waiving many prerequisites (having to do with explaining how the subdivided land would be used). This subdivision was followed by the sale of Pennhurst to a private developer. (February, 2008) Entire Pennhurst "lower campus" sold to Pennhurst Associates for $2 million. 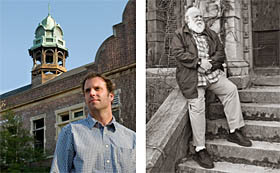 (February, 2008) Pennhurst Memorial and Preservation Alliance (PM&PA) formed to advocate for the sensitive re-use of the site and urging decisionmakers to capitalize on its unique history and architectural features for the benefit of the region. Representatives from several major disability advocacy organizations, preservation experts and local residents join PM&PA board and advisory council. PreservePennhurst.org and online petition sites launched. (September 2008) Through PM&PA, Pennhurst's eligibility for the National Register of Historic Places is updated through the Pennsylvania Historical and Museum Commission. (November 17, 2008) Pennhurst added to Preservation Pennsylvania's list of the most At-Risk Pennsylvania Properties for 2008. (January 2009) Pennhurst, through PM&PA, becomes a member of the International Coalition of Sites of Conscience, a worldwide network of historic sites specifically dedicated to remembering struggles for justice. (August 2009) PM&PA, in partnership with the Preservation Alliance of Greater Philadelphia, obtains a service grant to complete a re-use design and feasibility study on the Pennhurst campus. 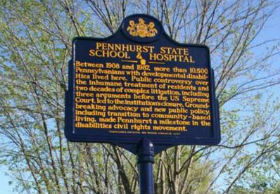 (April 10, 2010) Historical Marker to Pennhurst through PHMC to be dedicated along Route 724. PILCOP and PM&PA partner in a special event funded through Pennsylvania Humanities Council and the National Endowment for the Humanities. Pioneering work by the Law Center closed the former Pennhurst State School and Hospital, placing Pennsylvania at the vanguard of disability rights and making Pennhurst an internationally-recognized epicenter of one of the nation's great ongoing human rights struggles. PILCOP and PM&PA offer two-part event at Spring Hollow Golf Course, formerly part of the Pennhurst property. (October 2010) To the shock and dismay of many - especially those in the disabilities community - Pennhurst owners worked with Randy Bates of The Bates Motel Halloween attraction to turn Pennhurst's historic lower campus into a commercial Halloween "haunted" attraction. 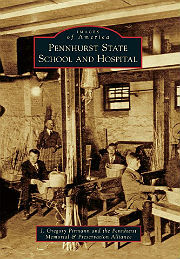 Arcadia Publishing published the book Images of America: Pennhurst State School and Hospital by PMPA's Greg Pirmann, working with the PMPA. PMPA signs agreement for future ownership of Pennhurst Superintendent's mansion located at the edge of the Pennhurst campus, and begins making plans to convert the space into an interactive educational and interpretive center and museum for disabilities.